A woman becomes torn between her husband and a man from her past as she uncovers a dangerous scheme in this third installment of a series. After a tumultuous adolescence, Dina Youngblood, a striking Seminole/Cherokee beauty, is married to evangelist Aaron Burning Rain. They reside in the Bitterroot Confederacy of Indians, coexisting with colorful neighbors (“A male alligator—halpatee, in what Uncle Donnie called ‘Seminole talk’—sounded his love song from a nearby waterway”). Aaron is devoted to Dina and planned to raise the son fathered by her former lover, Marty Osceola, as his own; but the child, whom they named Aaron Jr., was stillborn. While running errands, she meets a stranger who gives her an unsettling gift—a set of receiving blankets. Following a series of bizarre encounters with the figure, she learns that her son was kidnapped at birth by a criminal network and is still alive. While she searches for the truth, her husband reconnects with a former prayer partner named Nate Bush who has a mentoring program called Trail to the Stars that he wants Aaron and Dina to endorse. Dina is skeptical and soon realizes her son’s abduction is connected to the program. When Marty suddenly returns, Dina discovers that he may ultimately be the key to locating her child. In clear, engaging prose, Schaller (100+ Native American Women Who Changed the World, 2014, etc.) 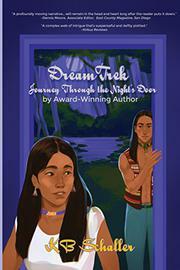 brings to life Dina and her quest to find out what happened to her son. One of the novel’s major strengths is its detailed setting and depiction of life on the Bitterroot reservation. The author offers an incisive and compassionate view of Bitterroot and the hopes and dreams of the people who call it home. The well-developed central characters include Dina and her great-grandmother Mama Hat. The mystery surrounding Dina’s son leads to a complex web of intrigue that’s suspenseful and deftly plotted. Schaller’s subplots are equally well-crafted. One of the most poignant comes in the form of Mama Hat’s journal entries about a young woman named Noccalula. Although this is the third novel in the series, the author provides enough back story to help newcomers understand the characters and their intricate relationships. A sprawling yet intimate kidnapping tale with a strong mix of action and character development.